Robotic satellite servicing spacecraft, like NASA's planned Restore-L vehicle scheduled to refuel the Landsat 7 satellite in 2020, can extend the mission life of satellites in orbit today. LONG BEACH, Calif. — Technologies that would service and refuel satellites in orbit are finally ready to move forward after years of technical, regulatory and financial challenges, industry experts said at the AIAA Space conference, held earlier this month. "My assertion is, we're over the hump on all of these [challenges], but that doesn't mean we have a satellite servicing paradigm and infrastructure available today," said Steve Oldham, senior vice president of strategic business development at SSL, a commercial space system design and construction company. He said he anticipates that those missing elements are coming soon and that, when they arrive, there's going to be a "paradigm change." Some of the technology for satellite-servicing missions has been tested already on the ground and in space. A series of government and private missions over the next five years will fully demonstrate these technologies in orbit, panelists said. "I think all of the technical barriers are either in the process of being demonstrated on the missions we're talking about here today or have already been demonstrated," Oldham said. He pointed to a picture of a robot being used to performing brain surgery on a patient while the surgeon operated the robot remotely from a faraway location. "If we can go and operate on people's brains from a surgeon in a remote location, I think we can go and operate on satellites," he added. A panel of industry and government experts gathered at the AIAA Space 2016 meeting to discuss the future of the satellite servicing industry. One step NASA is taking toward satellite-servicing capabilities is its Raven system, which will be attached to the International Space Station (ISS) to track crew and cargo vehicles as they arrive at and depart from the station. The data Raven collects will be used to demonstrate real-time navigation sensors and algorithms that will be incorporated into future servicing spacecraft and missions. NASA's Restore-L is one of those future servicing missions. 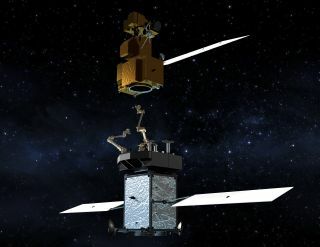 The spacecraft, set to launch in 2020, will refuel the aging Landsat 7 remote sensing satellite that was launched back in 1999, said Charles Bacon, chief cooperative servicing engineer of NASA's Satellite Servicing Capabilities Office. Bacon's office has led the space agency's research and development in satellite servicing, including flying the Robotic Refueling Missions (RRMs) that have demonstrated refueling and inspection technologies aboard the space station. The inspection systems are designed to examine damage and look for leaks on the exterior of the station. The RRM 3 mission, which is scheduled to launch in 2018, will demonstrate refueling using xenon and cryogenic fluids, Bacon said. The previous refueling effort transferred hydrazine, which is widely used in spacecraft thrusters. The Defense Advanced Research Projects Agency (DARPA), part of the U.S. Department of Defense, is in the midst of selecting a contractor for its own satellite-servicing spacecraft that is scheduled to launch in fiscal year 2021, said Gordon Roesler, program manager for the agency's Robotic Servicing of Geosynchronous Satellites program. "We hope to demonstrate over and over again, through dozens of missions — we'll carry enough propellant to do these servicing operations dozens of times — that it's reliable, that it's safe, it's efficient and that it's useful," Roesler said. Oldham said SSL has developed a servicing architecture that uses a spacecraft with sufficient propellant to refuel up to 50 spacecraft. With each refueling operation taking approximately a month, the company should be able to refuel a dozen satellites per year. The U.S. Defense Advanced Research Projects Agency is studying how in-space servicing of satellites can be achieved with robotic spacecraft as part of its ongoing Robotic Servicing of Geosynchronous Satellites program. To be successful, a servicing system must be reliable, highly maneuverable and capable of performing multiple repair, maintenance and fueling activities, he added. "The answer can't be, 'I'm busy; I'll be with you in two years.' It's not going to work," Oldham said. "The answer can't be, 'Sure, I'll come around, but when I get there, I only carry one tool. I don't have another tool. So, sorry.' It can't be, 'Do you want our … repair people, do you want our spark-plug changers, do you want our collision towers? We have a separate vehicle for each one.' I want the ability for a servicing vehicle to come to me right now and do whatever I need." Oldham said the airline pricing model could be applied to satellite servicing: Those that need service right away would pay more than those willing to wait awhile. The commercial spaceflight provider Orbital ATK is taking a slightly different approach to its robotic servicing system. The company's mission extension vehicle (MEV) will dock with a satellite and provide attitude control, station keeping and end-of-life disposal. "We developed the mission extension vehicle, the MEV, to really create a new industry," said James B. Armor Jr., staff vice president for Orbital ATK. "Its initial purpose, as I said, was docked life extension at geostationary orbit. It also provides hosted payload space, or you can lease the vehicle. It's based on our GEOStar [satellite] bus, and it's compatible with most launch vehicles." MEV-1 is due to launch in the fourth quarter of 2018, with service commencing in May of the following year. Intelsat has signed up as the first customer. Armor said Orbital ATK plans to enhance the MEV as new technologies mature. The company has signed several Space Act Agreements with NASA to facilitate sustained technology transfer. It is also involved in Restore-L and other NASA robotic programs. Satellite servicing would bring some significant changes for the companies that insure satellites, Oldham said. Premiums paid to insure satellites and payouts when things go wrong currently range from $500 million to $1 billion per year, he said. "The insurance industry can be a significant catalyst for satellite servicing," Oldham said. "A satellite-servicing capability that's available gives them an option to not pay out, which is what they want to do — not pay out. If you can repair a satellite, if you can relocate it after a failed launch, they could avoid a substantial payout. So, I think, when proven, the insurance industry will be both a customer, and then they will become an enabler for satellite servicing." Panelists also said that, once the technology is proven, robotic spacecraft will be able to assemble large antennas, modular satellites and other structures in orbit, and engineers will be freed from the constraints of narrow payload fairings used to protect payloads during launch.